The Harry Potter ‘hero’ crab, Palau president’s colonial anemone and the ‘living fossil’ octocoral published in ZooKeys along with the Bob Marley’s intertidal spider from the pages of Evolutionary Systematics made it to the top in the two lists compiled by the World Register of Marine Species (WoRMS). The ‘TOP 10’ charts mark the 10th anniversary of the organisation dedicated to noting down all creatures splashing around Earth’s marine habitats. While the three species in the ‘Ten remarkable new marine species from 2017’ list have been bathing in glory mostly thanks to their prominent human namesakes, the octocoral from Japan found a place amongst the ‘Ten astounding marine species of the last decade (2007-2017)’ after being identified as a ‘living fossil’. To compile the lists, WoRMS first invited all their editors to nominate their favourites in the two disciplines, and then asked a small committee of taxonomists and data managers to provide their votes. Without further ado, let’s dive into a little bit of a reminder to find out exactly why and how those particular species turned up at the top. 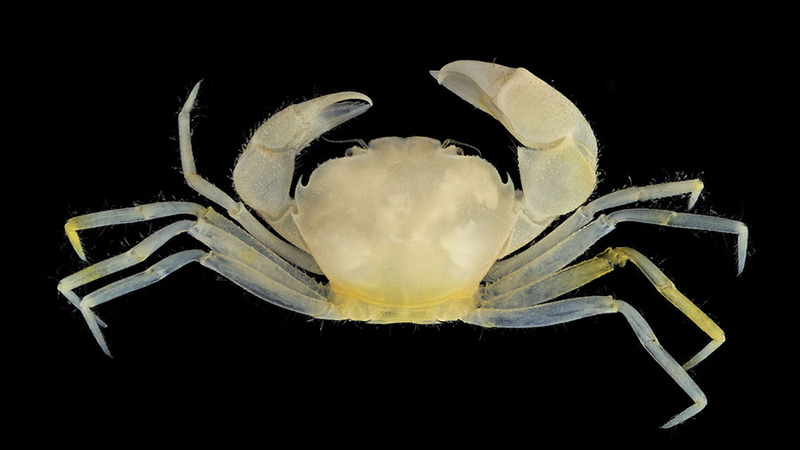 To the delight of the millions of fans of the iconic fantasy franchise Harry Potter around the world, a new species of charming crab discovered in the coral reefs of the island of Guam, the Pacific Ocean, was named after not one, but two of their favourite characters – protagonist Harry Potter and the villain-turned-hero Professor Severus Snape. Luckily for lead author and self-confessed ‘Potterhead’ Dr. Jose Christopher E. Mendoza, the crustacean was simultaneously identified as a new species and a new genus, which made it possible to have the genus name (Harryplax) ‘reserved’ for the famous fictional wizard, while the species name (severus) remains dedicated to his secretive teacher. Furthermore, the two scientists – Dr. Jose Christopher E. Mendoza and Dr. Peter Ng, both affiliated with the National University of Singapore – used the scientific name of their rubble-inhabiting discovery to pay tribute to its initial collector – Harry Conley. About 20 years ago, the “soft-spoken ex-Marine with a steely determination and a heart of gold” collected a curious-looking crab from the waters of Guam to unknowingly hand his successors with a piece of nature’s undescribed gems. Learn more about Harryplax severus on our blog or read the study published in our open access journal ZooKeys. It’s true – underwater spiders are for real! Keep calm, though, they tend to be tiny and harmless to humans, so you are highly unlikely to get in contact with them by pure chance. Scientists Drs. Barbara Baehr, Robert Raven and Danilo Harms, affiliated with Queensland Museum and the University of Hamburg, themselves, had to stay alert and wait for the low tide at the coastline of Australia’s “Sunshine State” of Queensland, in order to spot and collect the several-millimetre spider now known as the Bob Marley’s intertidal spider (or Desis bobmarleyi if you stumble upon it in the academic books). Fans of the legendary reggae musician, the biologists were quick to link the emergence of the arachnid to a favourite song – “High Tide or Low Tide” – and its underlying message about love and friendship through all struggles of life. Check out our blog post on Desis bobmarleyi or go read the full study appearing in the open access Evolutionary Systematics and its first issue published since the journal joined Pensoft last December. Yes, the species in the picture is an animal living in the sea, even though Anemone is also a genus of flowering plants growing on the ground. Confused? In fact, the two have nothing to do with each other, apart from their ‘flowery’ appearance. While researchers from the University of the Ryukyus, Kagoshima University, Japan and the Palau International Coral Reef Center were studying the sea anemones living on top of black coral colonies in the Indo-Pacific Ocean, they discovered a total of three new lovely species (allegedly, even more! ), where one, Antipathozoanthus obscurus, was spectacular with its preference for hiding in the narrow reef cracks, rather than ‘perching’ proudly on corals. Amazed by the quantity of yet to be explored biodiversity at the studied localities, including the island country of Palau, the scientists took the occasion to say Thank you to Palau’s President Tommy Remengesau for his nation’s support. By naming one of the new species A. remengesaui, the scientists also pay tribute to the politician’s vision on nature conservation which has already placed Palau “at the forefront of marine conservation”, as noted by senior author Dr. James Reimer. Find more about the new anemones from our blog post or check out the full study openly accessible in ZooKeys. Dubbed ‘living fossil’ for having much more in common with extinct species than it has with its ‘living’ relatives, this octocoral discovered in Okinawa, Japan, comes to show that sometimes it’s staying calm and still on the (shallow reef) surface that takes you places. Here, the extraordinary, in modern sense, octocoral species landed a spot among the ten most astounding marine species of the decade. The ‘living fossil’ resembles the extraordinary blue corals, which are said to have been widely distributed around the globe during the Cretaceous period. Much like its ancestors, it sports a hard skeleton of calcium-carbonate, explain graduate student Yu Miyazaki and associate professor Dr James Davis Reimer, University of the Ryukyus. Planning a trip to Okinawa? Keep an eye open, as this unusual species prefers depths of less than a meter, which is once again quite the contrary to the habitats picked by its contemporaries. Check out our blog post on the ‘living fossil’ octocoral and find the study in our open access journal ZooKeys.